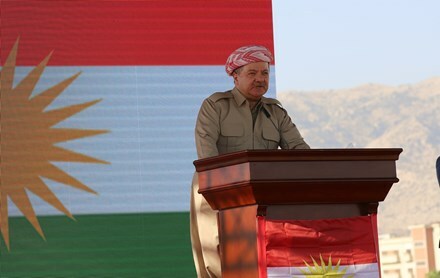 Salahadin, Kurdistan Region of Iraq, (Krp.org)- President Masoud Barzani released a statement today directed at the people of Kurdistan, living both in the Region and abroad as well as to the public opinion worldwide. The President commences the statement by saying that the people of Kurdistan had peacefully engaged in a democratic exercise to decide on their destiny which is a natural right of any and all nations. As a result of the Kurdistan Independence Referendum, the people of the Kurdistan Region have been under attack and punished by a blockade by the Iraqi government. These aggressive policies of punishment by the Iraqi government have resulted in a severe economic impact on the Region and have led to the displacement of 150,000 civilians from their homes. The President calls upon the international community as a whole to work towards ending these aggressive measures by the Iraqi government against the people of Kurdistan. He calls upon the conscience of humanity to impede the occurrence of another genocide against the people of Kurdistan who are now living under the oppression of the Iraqi government. The statement says that it is unfortunate that because of their interests, many of the governments around the world have forgotten the sacrifices of the Peshmerga forces during the war on the terrorists of the Islamic State. They have forgotten, the President adds that the Peshmerga forces were recently fighting against the terrorists of the Islamic State on behalf of the free world. It was during that war, the statement says, that thousands of Peshmerga forces paid the ultimate sacrifice or were wounded.